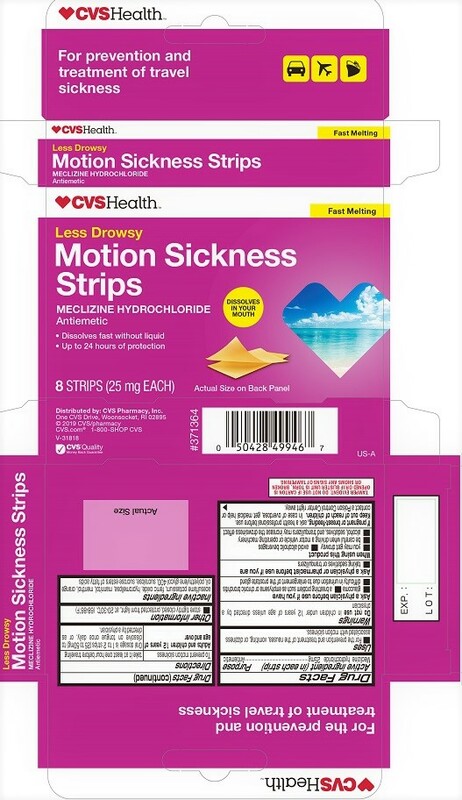 Proprietary Name: Cvs Motion Sickness Strips What is the Proprietary Name? Non-Proprietary Name: Meclizine Hydrochloride What is the Non-Proprietary Name? Cvs Motion Sickness Strips with NDC 69842-288 is a a human over the counter drug product labeled by Cvs Pharmacy. The generic name of Cvs Motion Sickness Strips is meclizine hydrochloride. The product's dosage form is film, soluble and is administered via oral form. Dosage Form: Film, Soluble - A thin layer or coating which is susceptible to being dissolved when in contact with a liquid. FDA Application Number: part336 What is the FDA Application Number? Uses■ For the prevention and treatment of the nausea, vomiting, or dizziness associated with motion sickness. DirectionsTo prevent motion sickness take it at least one hour before traveling Adults and children 12 years of age and over: Oral dosage is 1 to 2 strips (25 to 50 mg) to dissolve on tongue once daily, or as directed by a physician.